From antiquity the sea was the best, or only, way to navigate between the mountains. Patterns of habitation developed around these watery highways. Elgol is a place of transit. Its most famous visitor, Bonnie Prince Charlie, stayed briefly in a cave near the harbour following the disintegration of the '45 rebellion. Having landed in the North, he furtively crossed the island, making a taxing nighttime traipse over moor, through valleys, to reach Elgol, then onward to the mainland and France and exile. The naturalist Gavin Maxwell wrote his best-known work, Ring of Bright Water, in Sandaig, which looks out from the mainland over a small archipelago to Sleat. Initially, though, Maxwell’s path through the mountains took him from England to Soay, an island just off Elgol’s coast. As a means of getting away, he set up a basking shark fisheries processing-plant on the island – a somewhat suspect undertaking for a naturalist. The venture followed the curve in the price of oil, a boom followed by a hard decline. It went bust in 1948. For the maritime traveler, the mountains are more than an interruption of the horizon. Northern Spanish sailors named a range of mountains Picos de Europa because it was the first land sighted by the returning fleets. Mountains are a writing that tells you where you are; for those that can read the land and know the signs, the mountains point to safe harbours and passages through the narrows. The mountains were represented on old charts in silhouette as a guide to seafarers, aiding meaningful comprehension for navigational purposes by way of the landscape. As well as welcoming, the mountains also bid farewell. For those leaving the islands, the mountains are the most persistent feature, the last to fall below the horizon. For those leaving for the final time, such as Bonnie Prince Charlie, or those immigrating on clearance ships, the last sighting of the mountains must have incurred something of a sublime pathos. In an allusion worthy of Hieronymus Bosch, Dùn Scaith Castle was said to be ‘protected by a pit full of snakes and beaked toads’. It pre-dates its clan inhabitants, the MacLeods, MacDonalds and MacAskills, for whom it became strategically significant much later. Before them, the fabled Sgathaich, a warrior-queen, provided something of a residential training programme – with added benefits – for would-be heroes. The landscape was an emphatic testing ground for the fearless. 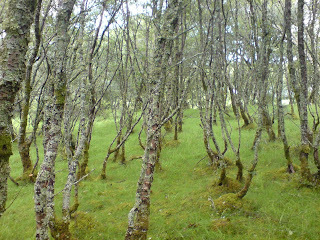 The deciduous woods on Sleat held mythic terrors, alongside some more immediate ones. It is likely that Skye was far more densely forested then than now, and in those wooded areas roamed wolves. The impetus behind locals’ and visitors’ deforestation of Skye was in part firewood, ship-building and construction, but it was also to clear the habitat of the wolves. As the forest survived for longer in Sleat, traditionally the garden of Skye, one can imagine that it was those wolves’ final stronghold. Sgathaich's most famous pupil, Cuchulain, displayed exceptional prowess in the martial arts. He was famed in particular for his Salmon-leap maneuver, but his name comes from those beasts of the forest, translated as either ‘hound’ or ‘wolf’. The forest has mythic and mystic connotations; Sròn Daraich, near Dùn Scaith Castle, is an oak grove with a Druidic history. The pragmatic clearing of such places, the removal of the terrors of the forests, troubles their spiritual purpose. Could this be a distant echo of the land spread at the foot of Blabh-bheinn? In the valley of Strath Suardal near the base of the mountain, there are sites that suggest a link to early worship of such a feminine form of deity. Clach na h'Annait is a standing stone related to the Goddess Annait (derivations of the name occur widely across Scotland), and further up the valley is High Pasture Cave, where recent archaeological findings suggest a Late Bronze Age burial site with strong female theistic connotations. The conflation of these Skye locales with Swinburne's developing esoteric interests is most likely without significance. But, just perhaps, Swinburne's journey wasn't the drunken jolly suggested in his journal but rather a prelude, a pilgrimage, a nascent encounter with the muse. In 1931 P&O liners launched two ships almost simultaneously. Named Strathnaver and Strathaird, they were the first in a series referred to as ‘the white sisters’. Both had three funnels – two were cosmetic – and serviced the route from the UK to Australia. The ships were named after the P&O chairman Lord Inchape’s full title and the peninsula on Skye, respectively. Yet, inadvertently one would hope, the names also refer to two sites of clearances in Scotland. The Strathnaver clearances in Sutherland are infamous, and those in Strathaird were the effect of a failed potato harvest and a threatening landlord who wished to profit from putting the land to work with sheep rather than people. Eventually, in 1851-2, the populace of Strathaird was expatriated to Canada. It seems an unfortunate echo that these boats named after places subjected to clearances plied a route not dissimilar to that which many affected by the clearances throughout the Highlands were forced to take. A few years after his visit to Spar, Scott wrote of another cave at the summit of a mountain in the south of France. In Anne of Geierstein, the Provençal legend of the Lou Garagaï cave on Mont St Victoire is adapted by Scott to become the portal to the netherworld; from its mouth can be heard the prophetic cries of those from the beyond. But in the Western Isles he had already encountered an even more terrifying cave, and not one of fiction. From the southern premonitory of Sleat the volcanic plug of An Sgurr on Eigg is visible. Towards the south of the mountain, near the sea, is Massacre Cave. In 1576, during a period of feuding between the MacLeod and MacDonald clans, the island's people hid from the MacLeods in the cave. They thought they had evaded the clan, but the Macleouds had luck on their side and tracked them. Lighting a fire at the cave’s entrance, they managed to asphyxiate all within. It is easy to be daunted by the profusion of names in wild places. The bruises of designation that scatter maps are invisible when confronted with the geological fact. Indeed, the act of corroborating the empirical with its appellation is fraught with difficulties. No doubt William Woodman Graham, the pioneering Himalayan mountaineer, would have attested this. Believing to have reached the summit of Changabang in the Himalaya in 1883, it is now widely accepted that Graham missed his quarry and succeeded only on a subsidiary peak of Dùnagiri. But the mountaineer never thought he was climbing Changabang, the Shinning Mountain. For him it was ‘A21’, a rather more prosaic surveyor's denomination. Names are matters of convention and cultural relevance. Recently Ohio took congressional impediments to prevent Mount McKinley in Alaska (named in honour of the Ohio born President William Mckinley) being re-classified by its aboriginal name of ‘Denali’ – a proposal advanced by the Alaskan Legislature to the US Board on Geographic Names. Naming is more than an act of linguistic pointing. What then should we call Sgùrr Alasdair, the dominant peak of the Black Cuillin? Its name comes from Sheriff Alexander Nicolson, who climbed the mountain in 1873. Seton Gordon, the cultural historian of the highlands, and of Skye in particular, offered Sgùrr Biorach and Viorach as two possible 'original' names. Similarly, Sgùrr Mhic Choinnich (also in the Black Cuilin) was named after the Skye mountain guide John Mackenzie, and Sgùrr Thearlaich (Gaelic for ‘Charles's Peak’) refers to the mountaineer Charles Pilkington and his ascent of the mountain in 1887. These names articulate a rich narrative of Victorian mountain exploration, but at the same time they obscure deeper layers of cultural history. Following the clearances, even the burns and rivulets lost their denominations, lacking a populace to refer to them. Is there an ethical imperative to reclaim these peaks’ and other topographical features’ earlier names? How far back does one need to go to find the 'true' or 'original' name? The mountains remain stoically obstinate to this flurry of labeling; the names on the map are a moment in an historic continuum. Perhaps there is another approach, to look upon the landscape with willful ignorance, and to try to observe, as Paul Valéry observed, that ‘to see is to forget the name of the thing that one sees’. The Corbusian aphorism – that his variety of modernism was seeking to create an architecture which mechanized the quotidian existence – could be mistaken for a revolutionary approach. But the lived environment extends beyond the built. Architecture does not require a roof. A machine is about efficiency, and sometimes the wilderness is mechanized to that end. At some point the stream connecting Loch na h-Airde to the sea was modified to function as a means for boats to be taken in at high tide. The canal, most likely used for construction and maintenance, was the result of a certain attitude to the landscape; the given features of the land were augmented to a functional end. This landscaping has been attributed to the Vikings, although it most likely predates them. The Vikings, nevertheless, are a useful cultural symbol for militarized technological incursion. Whoever affected this modification, it was an eloquent use of topography, yet it was exceptional only in its ingenuity. Our improvements to the landscape are endless. Once abandoned, however, these augmentations are slowly reclaimed by the wilderness, leaving only echoes and ghosts of the earlier machines of the land. The Great Beast left Sligachan on a summer morning in 1892, headed for Sgurr nan Gillean. Though he wasn't yet The Great Beast to his mother and Sir Joseph Lister who accompanied this 17 year-old at Slighachan Inn – he was Alec or Aleister Crowley – the Sunday Express would later describe him as ‘the wickedest man in the world.’ He'd wandered in the hills before, but this was his first venture in the mountains. Accompanying a group of experienced climbers he took the pinnacle ridge route to the summit, which ignited in him a passion for high places that culminated in his leading expeditions in the Himalaya. Crowley maintained momentum from his success on Sgurr nan Gillean and went on to climb Sgùrr a'Gharaidh, Am Basteir, Sgùrr a'Mhadaid, and the Bloody Stone in Harta Corrie. The Bloody Stone is not a mountain but a large boulder; its gruesome name is attributed to its role in the final battle between the clans MacDonlad and MacLeod in 1602, where the corpses of the slain were piled around the rock. Imagining such a gory totem could well have excited latent necromantic tendencies in the young Crowley. Indeed, the skirmishes between the MacDonalds and the MacLeods seem to favour such a fleshy architectural idiom. The 1578 Battle of the Spoiling of the Dyke, a Macleod retaliation for an earlier massacre, resulted in another, with all the MacDonalds slain and their bodies piled on a dyke. A landscape bloodied. A couple of years later, pioneering new routes on the popular suicide spot of Beachy Head, Crowley’s thoughts must have returned to Skye as he conquered a demoniac chalk fissure, the Cuillin Crack. Ten years after Crowley's ascent of the Bloody Stone, he and fellow climber Oscar Eckenstein led the first significant attempt on K2. They reached a height of 6525 metres, well short of the summit at 8611 metres, but a nonetheless impressive achievement given the technology of the day, and considering that Crowley was carrying the residual effects of a bout of malaria. In 1905 he led his final expedition, this time to Kanchenjunga, the third highest mountain in the world. It didn't go well. High up the mountain there was a fight (supposedly physical), a mutiny, and (allegedly) a curse. The details are disputed, but ultimately four mend died. Crowley gave up on the mountains after that, and his interests in the occult intensified. On the slopes of Ben Lee in 1882 a herd of sheep grazed, but as an act of rebellion and protest it could appear somewhat mute. Nevertheless, the action was one of fundamental defiance as the local crofters, in the face of eviction, moved their sheep onto the land and refused to pay rent. The local police were quickly overpowered and forced to burn the eviction notices. Only with help from the Glaswegian police force did the authorities manage to prosecute some of the crofters, but given the fervour of the resistance and the spread of revolt to other parts of the island, a commission was convened to assess the crofters' grievances. This Battle of the Braes was celebrated in a song that gives prominence to the role of the whole community. Went out to bar the way. This struggle may well be the last battle to have been fought on British soil. Dùn Caan on Raasay was higher than the Cuillin. This is not meant as a contrived geological fact, although being an eroded basalt cap it would once have been somewhat grander in stature. Rather, it was a local perception that the 443m peak was greater than those peaks of the Cuillin, which push to nearly 1000m. It is not clear whether this was the result of a form of localized braggadocio or simple ignorance. Boswell speculates that the error can be accounted for, to some extent, by the steep rise from the sea. Of course, at that time the surveying of peaks was comparatively unsophisticated, and speculations of heights varied widely. Boswell's tramp to the summit of Dùn Caan incurred so little fatigue that, once there, he performed an impromptu jig. When Bonnie Prince Charlie was hiding on Raasay, Flora MacDonald used a dance to distract his pursuers. ‘Flora MacDonald’s Fancy’ is a slightly salacious dance with quick turns and shuffles and a flashing of the petticoat. The dancer holds the hem of the kilt just high enough to ensure a glimpse is seen. This minor flirtation has been attributed to MacDonald’s wish to divert red coat officers from her true purpose on Skye. But for others this style was for the Pretender's eyes, it being claimed that the dance was performed by her as a farewell before they parted. Of course it is likely the dance is a fiction created after the fact and is open to various ascriptions of meaning – maybe the flashing of petticoats alludes to the Pretender's cross-dressing escape. But perhaps the dance Boswell performed on the summit of Dùn Caan owes a little to Flora MacDonald. Or maybe it related to that other dance of departure he and Johnson witnessed in Ullinish. Called America, it developed through progressive twirls, which Boswell suspected were evocations of the process of emigration. There is a great deal of fiction set on Skye, but not all of it will correspond to the island as it really is. 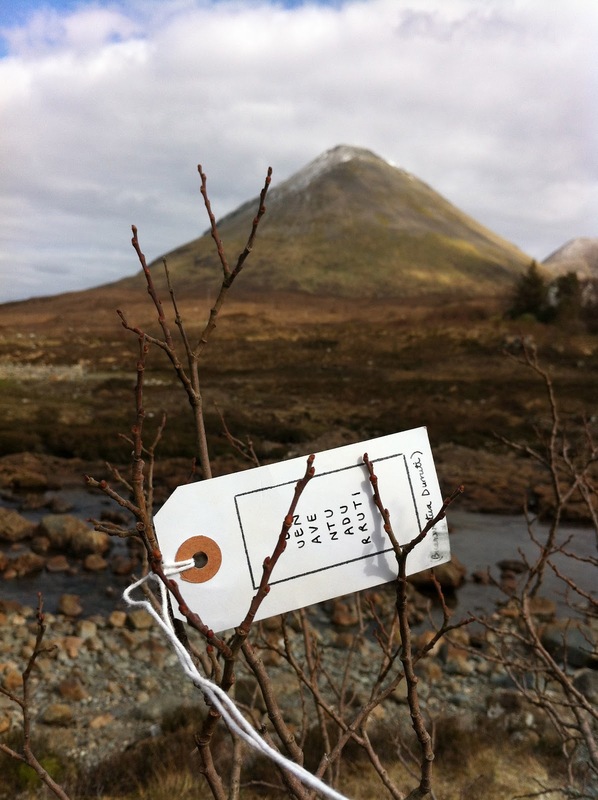 Skye serves as a convenient literary shorthand for places that are remote, mythic or slightly unknowable. Even in Harry Potter there is a quidditch team from Skye, The Pride of Portree. An alternative strand of critique sees Woof’s choice not as arbitrary, but invoking Skye’s particular literary heritage. From Johnson and Boswell, ‘The Skye Boat Song’, and Walter Scott, there is coherence between Woolf's choice of location and her wider objectives. The island's history of enforced emigration, its anti-imperial heritage and related struggles, have been proposed as contexts that Woolf was deliberately trying to evoke. Further, it is claimed that her parents were fans of Walter Scott (Mr Ramsay reads Scott's The Antiquary in the novel) and that the actual setting of the book is Talland House in St Ives, which Woolf's parents rented during the summer. Skye, via Scott, is Woolf's escape from sentimentality, which refers back to the sentimentality it seeks to avoid. And, of course, Scott came to Skye while on a tour of lighthouses. Dr Johnson & Boswell’s island odyssey included a few days at Ullinish on the western coast of Skye. During their stay the pair took a walk up to the Dùn above the village. From there they were afforded a dramatic view over Loch Bracadale and further to the islands of Barra and South Uist. But the Cuillin range dominate the view southward, and these mountains reminded Boswell of the hills around Corte in Corsica. Boswell’s activism resulted in the growth of public support in Britain for the Corsican cause. Combined with the culturing of influential friends, this enabled him to support the arming of the Corsicans, with the result that thirty canon were sent from the Carron Ironworks in Falkirk to support the effort. Neither was Boswell averse to the use of showmanship to raise the struggle’s profile, appearing at the Shakespeare Jubilee at Stratford-upon-Avon dressed as a Corsican Chief. For some, the mountains have a mystical inflection. René Dumal, echoing a deep philosophical tradition, suggests that the lure of the mountain ‘is the connection between earth and sky. Its highest summit touches the sphere of eternity, and its base branches out in manifold foothills into the world of mortals’. It may be open to speculation that for Aleister Crowley the closing of this means of correspondence between the noumenal and the eternal accelerated his seeking it elsewhere. No longer did summits facilitate a release from materialist restraints. This speculative metaphysics has an ancient echo in Skye. On the top of Healabhal Mhor (Macleod's Table North) is a Neolithic chambered cairn, with burial chambers distinctly visible, their occupants long departed. The cairn is a material assertion of the summit's liminal nature. It is a culmination, transitory, upon which the corporal finds it difficult to rest. Or, in a different vein, how would the pre-tectonic mind comprehend the curiously fractured nature of the Quiraing? The earth appears to have opened up. It is unsurprising that the descriptive names attributed to its features refer to an architecture of monstrous scale. Kilmuir cemetery overlooks Lub Score, a long, gently curving bay. Beyond the water rise the mountains of the outer Hebrides. Not far to the south is Kilbride, where Flora MacDonald and the Young Pretender landed during his flight to exile. But it is at Kilmuir that Flora is buried. Her gravestone bears an epithet from Dr Samuel Johnson's description of her: ‘Her name will be mentioned in history and if courage and fidelity be virtues mentioned with honour’. Johnson had met MacDonald when he visited the island in 1773. Interned in the same graveyard are the ashes of Alexander McQueen. His father was born on Skye, and the fashion designer visited the island often in his youth. McQueen’s work bore reference to and identification with a highland persona, one which arose from a cultural imagination. Further around the coast, near Orbost on the western side of the island, is Rebel Wood. The wood is a forestry plantation established in memory of The Clash's Joe Strummer. Strummer was involved with Future Forrest, an organization that planted forests as a means of carbon off-setting. He also visited Skye, and Sorley MacLean's poem Hallaig was recited at his funeral in London. Skye is a place of material memory. Far out on the west of the island lies Neist Point. The lighthouse there featured in Lars von Trier's 1996 film Breaking the Waves. For the film a graveyard was created beside the lighthouse. It was not removed after filming had concluded, and for years it remained as a fictional site of memory. As MacLean’s ‘Hallaig’ reminds us, there are unintentional memorials throughout this island: those sites of abandonment, the result of the clearances, where ‘The dead have been seen alive’. photographs: Alec Finlay, Luke Allan, Alison Lloyd, Emma Nicholson & Ken Cockburn.